Croatian players celebrate their semi-final win against England. Bengaluru: By the end of the group stage of the World Cup in Russia, Belgium and Croatia were my favourites for the final. They had dominated their groups with attacking, attractive football. Both teams had an array of top-notch talent from leading European clubs. While heavyweights Brazil, Argentina, and Spain were superstar-centric, Germany followed the script of defending champions making an early exit. Italy and the Netherlands didn’t even show up. This World Cup was crying out for a new, ninth winner. Then, France emerged from under the radar in the knockouts. Their three-goal burst after trailing 1-2 against Argentina showed Les Bleus had earlier been playing within themselves to do just enough to advance. They went back to being clinical in their 2-0 dispatch of a Cavani-less Uruguay. Then they calmly sat on a 1-0 lead and watched their strongest opponents Belgium, the conquerors of Brazil, tie themselves in knots with positional changes. As Napoleon said, “Never interrupt your enemy when he’s making a mistake." So now we have a France-Croatia final which could be even better than the match-up I had wished for, because of their contrasting approaches. Croatia’s only option, if they can muster the energy one more time after three consecutive games of extra time, will be to control the midfield and probe the French defence as often as they can. In Barcelona’s Ivan Rakitic and Real Madrid’s Luka Modric, they have arguably the classier midfielders, although Manchester United’s Paul Pogba and Chelsea star N’golo Kante of France have shown they are quite capable of negating them. The tall Croatian centre-forward Mario Mandzukic will be lurking near the goal to pounce on anything that comes his way like he did to snuff out England. The strong Ivan Perisic’s surge in the semi-final, where he scored the equalizer, and then provided the assist for Mandzukic’s denouement, gives a new edge to their attack. And although Ante Rebic has been below par, he has the strength to hold his own on the other flank. Rebic’s volleyed goal in the group match against Argentina showed his prowess at the long-range finish too. And his replacement Andrej Kramaric scored an equalizer against Russia, underscoring the wide arsenal of weapons for Croatia. France, on the other hand, have a nuclear weapon which can bring a sudden end to this war: Mmmmm-Mbappe. He runs like Usain Bolt, back-heels with the dexterity of the Brazilian Ginga, and he’s the first teenager to score two goals in a World Cup game since Pele in 1958. What’s more, unlike the Portuguese speedster Cristiano Ronaldo, he’s sharing the spoils with his creative partner Antoine Griezmann, nicknamed Grizou with a hat-tip to Zinedine Zidane aka Zizou, the star in France’s 1998 World Cup win. Mbappe and Grizou have scored three goals each in Russia. But it’s not just in goal-scoring and assists that Mbappe influences the game. His speed forces the defensive line back because you can’t catch him if he gets past you. It’s the fear of Mbappe, coupled with the suspension of full back Thomas Meunier, that made Belgian coach Roberto Martinez alter his whole formation. Central defender Jan Vertonghen moved to the left, and this had a domino effect on other positions. Belgium could never reproduce the fluidity of attack they displayed against Brazil, and France were able to keep a clean sheet against the tournament’s top goal-scoring team. The Croatian defence of Ivan Strinic, Domagoj Vida, Dejan Lovren, and Sime Vrsaljko conceded only one goal in the group stage, but chinks appeared in the knockout games as four goals went in. They are strong defenders but none of them has the speed to keep up with Mbappe. 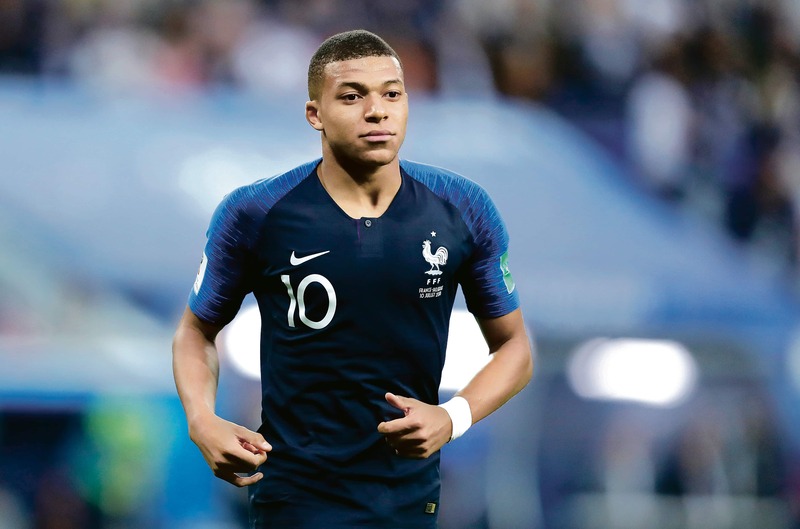 As for France, while Mbappe and Grizou make the headlines, the real steel is in their defence of Lucas Hernandez, Samuel Umtiti, Raphael Varane, and Benjamin Pavard. And the big centre-forward Olivier Giroud, who has been the one disappointment for France with not a single shot on target, drops back to win aerial balls off set pieces, just as Mandzukic does for Croatia. If the likes of Eden Hazard and Romelu Lukaku of Belgium could make no headway against this defence, will the Croatian forwards fare any better? They probably can, because the supply will be better from the Croatian midfield, if it can stop looking over its shoulder for the threat from Mbappe. We’re in for another intriguing tactical battle. French coach Didier Deschamps, a defensive midfielder in the 1998 cup-winning team, has disciplined his talented team to hold their fire until the enemy is in sight, then strike with counter-attack. Croatian coach Zlatko Dalic knows this, but has no alternative to taking the game into the French half. He cast the net for the most talented Croatians in the European clubs and came up with an ensemble of midfield playmakers. They will have to win it for him. The Croatians had a chequered run in the knockouts, but the way they came from behind in each of those games, overcoming fatigue, shows they have the talent, drive and character to see it through. We’ll see if they also have the smarts to outwit the French Deep Blue which seems to have all the answers, like IBM’s chess-playing supercomputer.